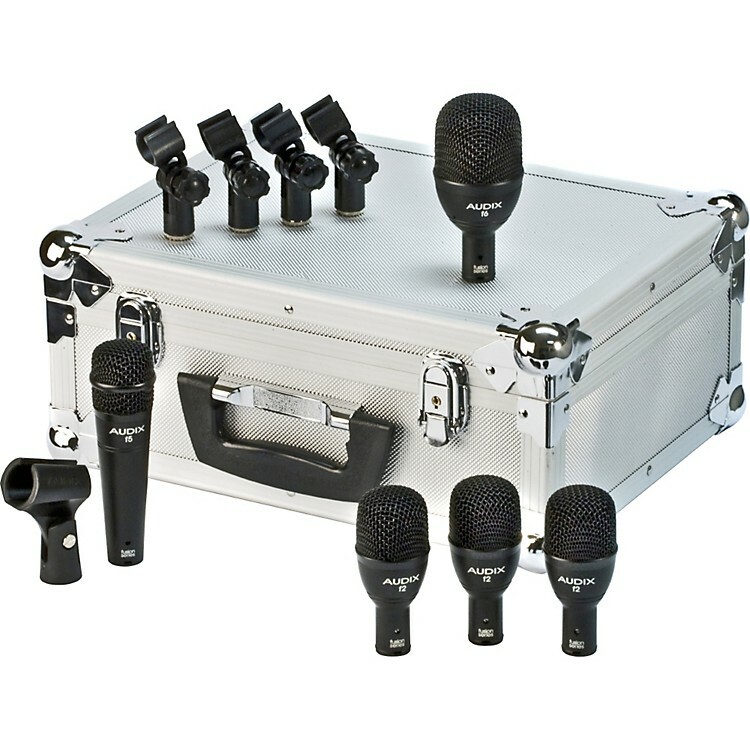 A 5-pack of dynamic mics made especially for drum miking. The Audix FP5 Drum Mic Pack contains 5 Fusion dynamic microphones: the f6 for kick drum, the f5 for snare, and three f2s for rack and floor toms. Each Audix drum mic is provided with the snap-to-fit DCLIP mic stand adapter, and the entire system is packaged in a heavy-duty custom aluminum carrying case. Designed, assembled, and tested by Audix in the USA, the f2 is a dynamic instrument microphone used for stage and studio applications. The f2 is characterized with a hypercardioid pickup pattern for isolation and feedback control and is equipped with a LM (Low Mass) diaphragm for natural, accurate sound reproduction. The f2 is lightweight, compact, and easy to position. With a wide frequency response of 52Hz-15kHz and the ability to handle sound pressure levels of 139dB, the f2 mic is an excellent choice for miking instruments with a percussive nature such as rack toms, congas, and even saxophone, guitar cabinets, and brass. Designed, assembled, and tested by Audix in the USA, the f5 is an all-purpose dynamic instrument microphone used for stage and studio applications. The f5 is able to handle sound pressure levels in excess of 137dB without distortion and can be used to mic a wide variety of musical instruments, especially the snare, but can also be effective on guitar and bass cabinets, vocals, and speech. The f5 is characterized with a hypercardioid pickup pattern for isolation and feedback control and is equipped with a LM (Low Mass) diaphragm for natural, accurate sound reproduction. Designed, assembled and tested by Audix in the USA, the f6 mic is a dynamic instrument microphone used for stage and studio applications. The f6, which is characterized with a hypercardioid pickup pattern for isolation and feedback control, is equipped with an LM Type A (Low Mass) diaphragm for natural, accurate sound reproduction. The f6 is lightweight, compact, and easy to position. With a wide frequency response of 40Hz-16kHz and the ability to handle sound pressure levels of 140dB, the f6 is an excellent choice for miking instruments requiring extended low frequency reproduction such as kick drum, large toms, and even bass cabinets. All drum mics in this Audix microphone pack feature roadworthy construction including a precision cast zinc alloy body, black-coat finish, laser-etched model and serial number, steel mesh grill, gold XLR connector, and a tension-fit, heavy-duty nylon mic clip. Their transformerless designs, low impedance, and balanced outputs allow for interference-free performance even with long cable runs.